What Words Are Uniquely French? The French language is notorious for its beauty and unique pronunciation. It seems to float off your lips when you speak it, dancing gracefully into your ears when you listen. Its beauty can make any French language program far more interesting. Perhaps this is the reason it draws in millions of students all over the world as one of the most popular langauges to learn. If you’re interested in any language learning program, then it helps to grasp words that truly belong to that language. 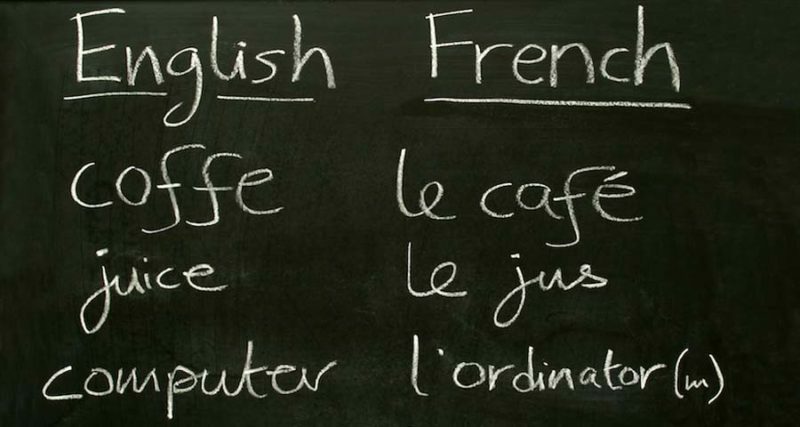 The following list is a compilation of French words with no English equivalent. Their construction and the feelings they communicate highlight aspects of French life and showcase how unique any foreign language learning experience can be. The direct French translation is “staircase wit.” It refers to the moment after a conversation when the time for quick replies has passed, and you’re on your own when you finally think of the perfect response. While there’s no English equivalent, the feeling is universal. We’ve all had that feeling of wishing we had only “come up with it sooner!” Except, in French, they have one word to express the entire feeling as a result of this specific situation. Leave it to the French to come up with a word for the “friend zone.” This phrase, meaning, “the exquisite pain” reflects the feeling of loving someone who will never love you back. Even in French, there’s no way to avoid the heartache of someone not returning the feelings you have. If you’re late and don’t want to be too specific explaining why, then you want to use this word. It means an “unexpected last-minute change of plans” and is an excellent way to avoid any additional questions. If you’ve ever felt like a fish out of water, then you’ve felt “dépaysement.” This word describes the unease of traveling in another country but not feeling as though you belong there. It’s not so much missing your country as it is being unfamiliar with all the differences you’re experiencing. A great word to remember if you plan on an immersion trip for a quick way to learn French. A flâner describes a specific kind of person. Brought to life from the poetry of Baudelaire, a flâner is a kind of observer that passes about the city taking in the sights and sounds. They notice changes in culture, but not for the sake of critiquing it, only to actively observe how diverse and fluid it truly is. This one you may already know. It is quite common and used to illustrate something that has just happened. The literal meaning is “there it is.” But it’s often used to showcase an event or direct attention. Created by French poet and dramatist, Émile Augier, this phrase means to be “longing for the mud.” It’s the feeling of wanting a simpler life than the one we have. Perhaps you’re a lawyer or a doctor, and you drive past a flower shop and think that you’d much rather enjoy life as a florist. Maybe the pay is less as well as the prestige, but there’s a hope for happiness that having a much easier life could bring. A word that translates into English as “pretty ugly” doesn’t quite convey its actual meaning very well. The term refers to someone who has a unique or an unconventional beauty. It’s the feeling you get looking at someone, knowing they don’t reflect the general cultural notion of attraction, but not being able to still find them attractive. Have you ever heard of the death drive? Well, “l’appel du vide” is similar to this, but in one specific difference. It means “the call of the void” and describes the urge of wanting to jump from a very high place when you’re standing next to a ledge. This word refers to a fake person or someone who pretends to be someone they’re not. It comes from the action of someone pretending to inhale from a cigarette. Have you ever been in a situation that was pure chaos? You look around, and you realize that a house fire with people running around screaming would be more organized and calmer. If so, then you’ve probably witness “tohu-bohu” or a state of pandemonium. It’s derived from a Hebrew word describing the world before the Judaic God created it. Annoy? Frustrated? Angry and in the mood to complain, but don’t want to feel overly judgmental? Well, in French, you can merely express râler to illustrate your dissatisfaction with the world in an eloquent, yet enlightened way. Do you want to talk about the next summer blockbuster? Then you can use cartonner to point out how great a moview was. It’s technically slang term to describe successful films, and it’s dervived from the action of covering an object in cardboard. This word is made up of two different French words, “contre” meaning against and “sens” meaning direction. It describes confusion or being wrong, but can also be used to describe “the wrong way” of doing something. Parents and older siblings will be very familiar with this word. When you’ve had enough and can’t take it anymore, when you’re “done,” you’ve experienced, “ras-le-bol” or “bowl full of it.” A similar expression in English would be to say that you’ve “had enough” or were “fed up” with something. Haven’t seen your best friend in a few years? The moment you two lock eyes after he walks off the plane and you run up and give each other a huge hug, that moment is retrouvailles. It describes the feeling of seeing someone again after a long time. On the surface, it may seem this word describes a “star” because it refers to any celestial body. However, it doesn’t mean so in a strictly scientific or observational sense. Instead, it refers to any object that is “out of this world.” While “astre” technically covers objects like stars, it covers exceptional people, ideas, and experiences as well. This is the perfect word to describe someone who’s out of their mind, crazy, or maybe just feeling a little more “YOLO” than usual. It combines “frapper” meaning to hit and “dingue” meaning crazy. It’s similar to asking someone “were you hit upside the head as a child” when they act crazy. Studying a new language changes the way you see the world. When you pick up a French language book and begin peering into the language, you begin to see the world a little differently. This list is by no means all of the unique phrases and words that don’t completely translate English, but it does help provide insight the dynamic French language.